Several years ago, I decided it was high time that I read Adolf Hitler’s manifesto, Mein Kampf. This is what I wrote in my review of the book: “You can call him [Hitler] a megalomaniacal monster, but he was nothing if not shrewd and determined. In Mein Kampf, he exhibits a keen understanding of propaganda, psychology, mass manipulation, class warfare … and the basest human instincts.” Much of Hitler’s prose, I recall thinking, seemed rather reasonable. Of course, that was his special talent: If you want millions to follow you, you can’t come off as a raving lunatic; you have to appeal to people’s sense of injustice in rational terms. Hitler also knew how to select a good biographer. 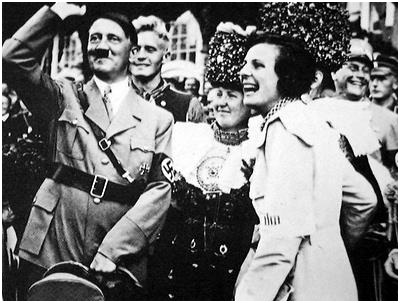 Triumph of the Will, Leni Riefenstahl’s infamous documentary featuring the Fuhrer at a 1934 political rally in Nuremberg, captures the mood and fervor of a nation falling under Hitler’s spell. This movie doesn’t excuse the Nazi movement – but it goes a long way toward explaining it. 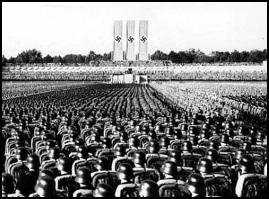 Riefenstahl’s challenge as a filmmaker was daunting: how to take footage of endless crowd scenes (parades, rallies, speeches) – all of it glorifying Hitler and the National Socialist German Workers’ Party – and make it compelling for nearly two hours. 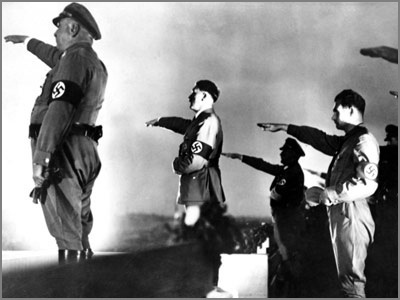 Despite her documentary’s stellar reputation as groundbreaking cinema, I think Riefenstahl was only partly successful. The camera angles (very high, very low, often dramatic), the editing (juxtaposing Hitler with smiling children – there are lots of smiling children in this film), and other filmic devices are indeed impressive. But a speech is a speech, and a parade is a parade. The political rants grow tedious, and the parades become repetitive. 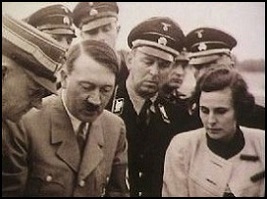 But for the most part, Riefenstahl was as talented behind a camera as Hitler was in front of one. As the film progresses, the crowds grow larger, Hitler grows more prominent, and the sense that something big is coming is palpable.